Carroll Sivco’s Ava, the inspiration for one movement of the world premiere by Francis Snyder, performed Sept. 30 by the Cape Cod Chamber Orchestra. Music inspired by paintings has a long history – and the Cape Cod Chamber Orchestra’s season-opening concert today in Harwich Port will continue that tradition. But a painting being created while music is playing – not so much history. Which makes artist Laura Balboni’s appearance Sujday with the CCCO all the more interesting. And Balboni’s presence turns the visual art into real-time event. She will draw a live work during the orchestra’s performance of Edward Elgar’s “Salut d’Amour,” beginning during the preconcert rehearsal, and continuing through the concert. “Music brings me to the most romantic place,” Balboni says. “To me, real life is gorgeous.” She has painted the orchestra twice previously, in rehearsals for last spring’s inaugural CCCO concert. Balboni also has worked live at weddings and has painted a number of Cape Symphony musicians as part of a “Face the Music” fundraiser for the orchestra two years ago. Francis Snyder’s work, a three-movement piece based on paintings by Erica Strzepek, Anne Briggs and Carroll Sivco, continues his appointment as composer-in-residence with the CCCO. Snyder’s settings of writings from Cotuit poet Judith Askew was the centerpiece of the orchestra’s inaugural concert this past April. “Francis has a unique sound,” Scinto says. “What strikes me about him is that he is very honest. I never feel like he’s trying to copy anything; it always sounds like a piece by Francis, throughout. 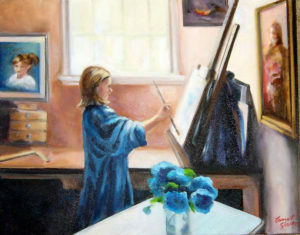 The three paintings chosen for the commission are quite different: Sivco has worked as a children’s book illustrator, and her “Ava” captures a young artist at work. Briggs’ “Bulb Lines 10″ is a highly charge still life, part of her “Veggie Hybrid” series; Strzepek’s “Hold Space” is a lush watercolor landscape. This program launches the first full season of the orchestra. Scinto has concerts planned for December, featuring Haydn’s “Farewell Symphony,” and programs next February, April and July. The April program will feature another premiere from Snyder and will be a collaboration with the Edward Gorey House in Yarmouth Port.